Hello! Pearl here, to share four cards that mixes this month's releases with some Mama Elephant originals from last year. This is perfect for ME fans who may already have a few of last year's favorites. I wanted to show you how to get more mileage out of your stamps. 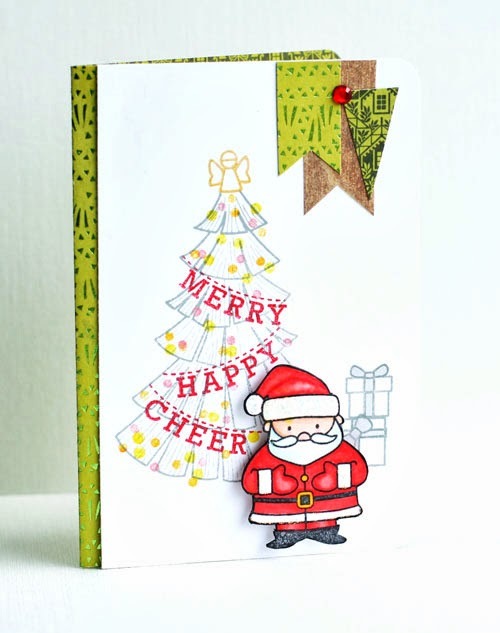 Let's start off with a card mixing the Santa Clause and Christmas tree image from Cozy Christmas with sentiment banners from Polar Pals. I love the tree image from Cozy Christmas because you can decorate it however you want as I did here using the sentiment banners from Polar Pals to trim the Christmas tree. I also added a subtle bokeh effect with a combination of sunshine, orangeade, and bubblegum dots as tree lights. The Copic-colored Santa brings the whole scene together on this card. 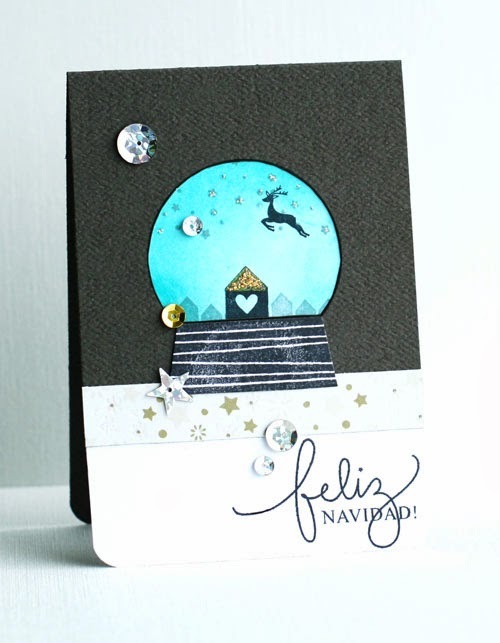 The next card uses the Feliz Navidad sentiment from Merry Greetings with house images from Full House and snow globe images from Believe in Magic. To create this card, I stamped the snow globe image from Believe in Magic and cut out the middle so that the scenery peeks underneath. I stamped a faint background of houses from Full House, starry sky and reindeer from Believe in Magic, and created a turquoise-distressed sky. Lastly, I added sparkle and shine with sequins and glitter. As you can see, Merry Greetings is a real must-have set for the holidays because the sentiments can be used for all of your holiday greeting needs. I decided to create a Thanksgiving card to kick off the holiday season. The birch tree and deer images from Winter Wonderland are perfect for creating a wintery scene or an autumn scene as scene here. I stamped the deer, a cute little bird sitting quietly on it, and two birch trees on a tag created using the Embellished Tags die. I absolutely love this die because it can be used to create the perfect tag for card making, scrapbooking, or just as a gift tag. I then created a birch tree background and layered the tag over some tissue paper leaves that was washed with glitter paint and sprinkled with sequins. 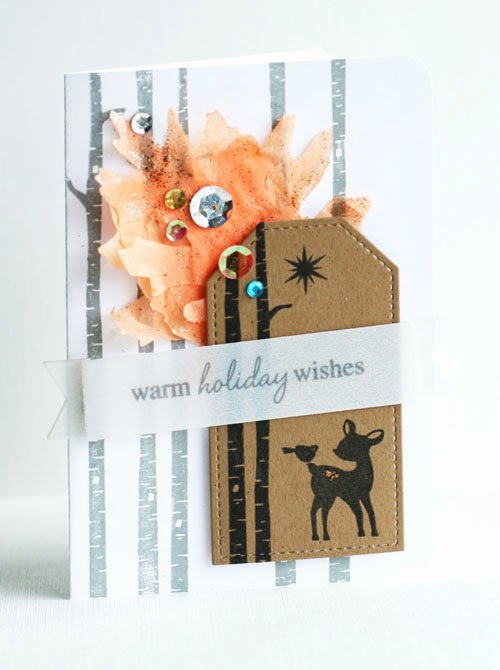 Lastly, I use the Bold Banner die to create a vellum label and stamped the "warm holiday wishes' sentiment from Polar Pals. 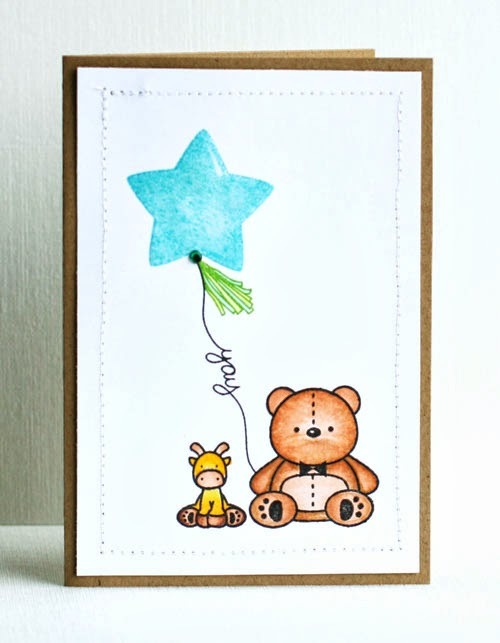 Finally, I created a card that combines the star balloon, tassel, and "yay" sentiment string from Party Kit with the bear and giraffe images from Nursery Decor. I used ME ocean ink and ME apple ink for the balloon and tassel, then further colored them with Copic markers just as I did with the stuffed teddy bear and giraffe. Oh and did you notice the little bow-tie on the teddy using the bow image from Party Kit? To give this clean and simple card a bit of dimension, I added shiny Glossy Accents to the balloon and stitched the edges. As you can see, the new Mama Elephant stamp sets are very versatile and can be mixed with older sets for even more variety so you can be sure that you get optimal mileage out of your stamps! Hope you enjoyed these cards! Love the cards - congrats to the winner Emily. Congrats to the winner. And beautiful cards! These are such great ideas for our upcoming Christmas cards! And congratulations Emily!! You lucky girl! Love all of today's cards...so fun! Congrats to Emily for being the Studio Calico winner! Very sweet cards today, thanks so much for sharing! Congrats to Emily too! Oh my! how cute your cards are. Lovely. Fantastic work Pearl. That snow globe is just gorgeous.